Since 2001 Community Chef has helped thousands of people to improve their cookery and nutrition skills. Our services include cookery workshops, cookery demonstrations, capacity building training, catering and community food consultancy. Community Chef delivers training courses for cookery leaders, food banks, community cafes and community organisations. Our training empowers others to set up and run their own food related initiatives which in turn improves the health and wellbeing of their communities. We run cookery classes and workshops from our own training kitchen. Our state of the art mobile kitchens allow us to deliver cookery and baking workshops almost anywhere. Expert tuition and a person centred approach ensures that our learners to become confidant cooks with a full range of kitchen skills. We also offer a range of bread making and baking workshops and train people to set up micro-bakeries and community bread clubs. 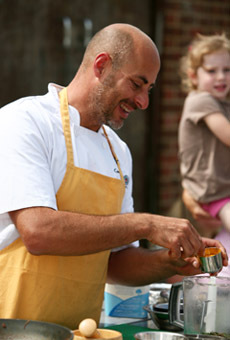 Community Chef delivers indoor or outdoor cookery demonstrations. Our interactive demonstrations are highly engaging and always very popular, especially as the audience gets to eat the food we prepare. We also deliver workplace health and corporate cookery demonstrations, helping organisations to look after the health and wellbeing of their staff. We love to feed people and specialize in seasonal, healthy catering for corporate, private and community functions. We also facilitate interactive catering where we involve participants in catering for their own event. Our smoothie bike is available for workshops and public events. We have our base at the Lewes Community Kitchen, but we work nationally with schools, community groups, charities, health and government organisations and ethical businesses. Community Chef is a social enterprise and we are constituted as a community interest company. We are dedicated to promoting a sustainable food system which provides good food for all. We support local food producers and most of the ingredients we use are organic. I hope you enjoy your visit to the Community Chef website. Please contact us to find out more about us and the services we offer.